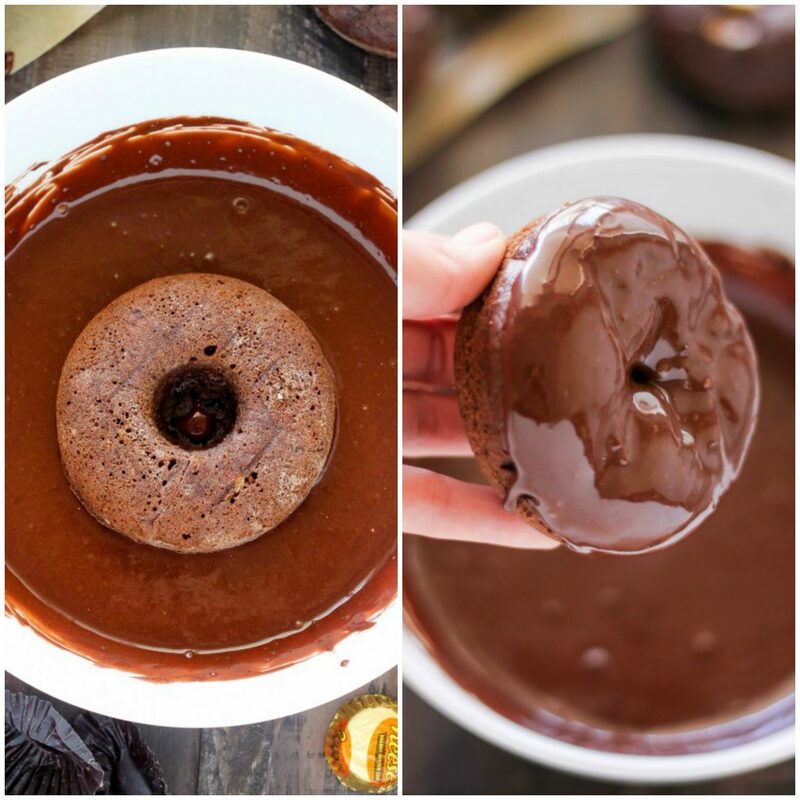 This easy recipe for super decadent Double Chocolate Peanut Butter Cup Donuts is a new favorite. 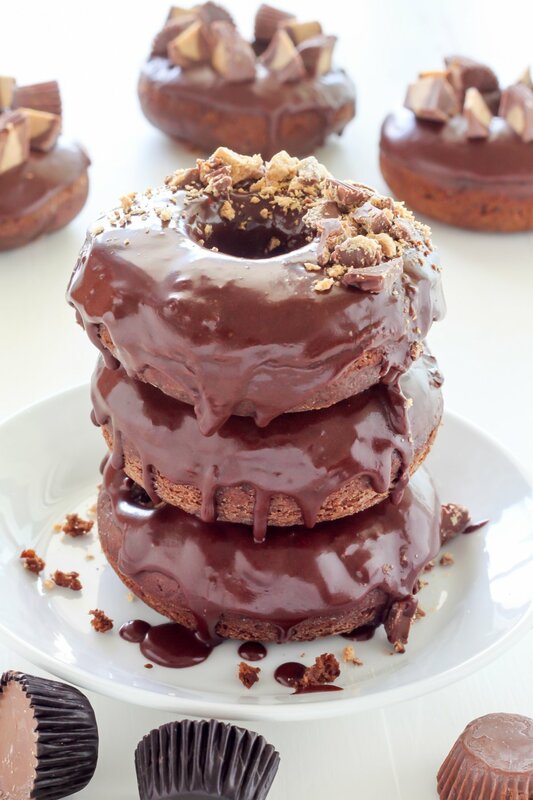 Fluffy chocolate donuts – baked, not fried – are studded with peanut butter cups and covered in chocolate ganache! Calling all chocolate and peanut butter lovers! This recipe right here is your donut dream come true. 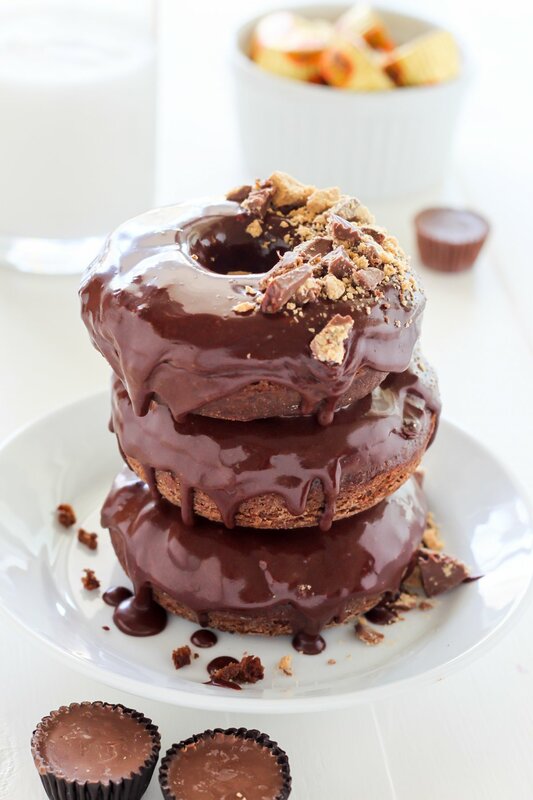 The chocolate donut base is rich, fudgy, and loaded with chocolate covered peanut butter cups; the chocolate ganache frosting is quick and luxuriously decadent; and the peanut butter cup finish makes these the ULTIMATE donut for any chocolate & pb fan <— If that’s you, preheat your oven NOW! 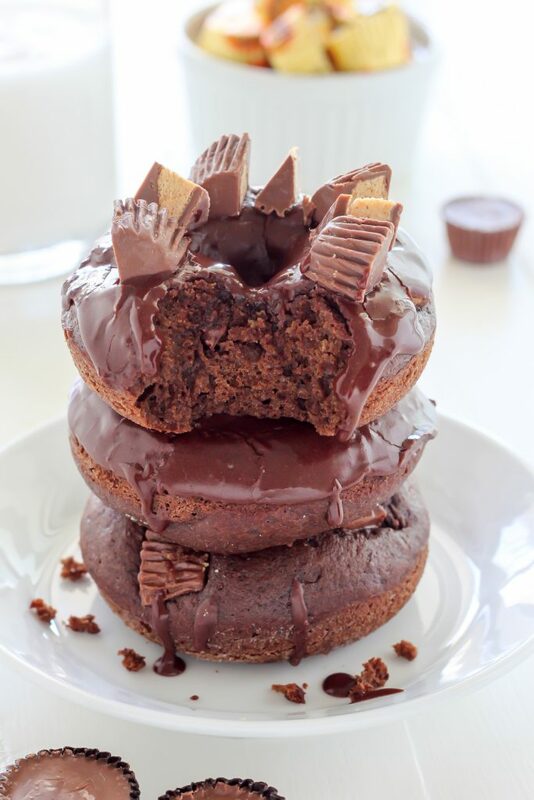 For the chocolate donut base you’ll need some simple ingredients: flour, dark brown sugar, salt, cocoa powder, baking powder, pure vanilla extract, 1 large egg, butter, creamy peanut butter, milk, and a couple mini peanut butter cups. The dry ingredients get mixed together; the wet ingredients get mixed together; then the wet and dry ingredients get mixed together to form a thick batter. You’ll spoon the batter into a greased donut pan, press the chopped peanut butter cups into the tops, and bake for 10 minutes. That’s it! I told you… these are almost too easy. While your donuts are cooling, you should make your ganache. Making chocolate ganache is really, really easy. You’ll need heavy cream and chocolate – that’s it! You’ll want to place your chocolate in a heatproof bowl (I like to use glass bowls here). Then you’ll bring your cream to a light simmer (just below boiling); and pour the warm cream over the chocolate. You’re going to let this mixture sit for a few minutes (this allows the cream to get the chocolate nice and soft), then stir like crazy! When you’re whisking you should start in the center and stir outwards, stopping only once your chocolate is completely melted and has evenly combined with the cream. And that’s that. You just made ganache! 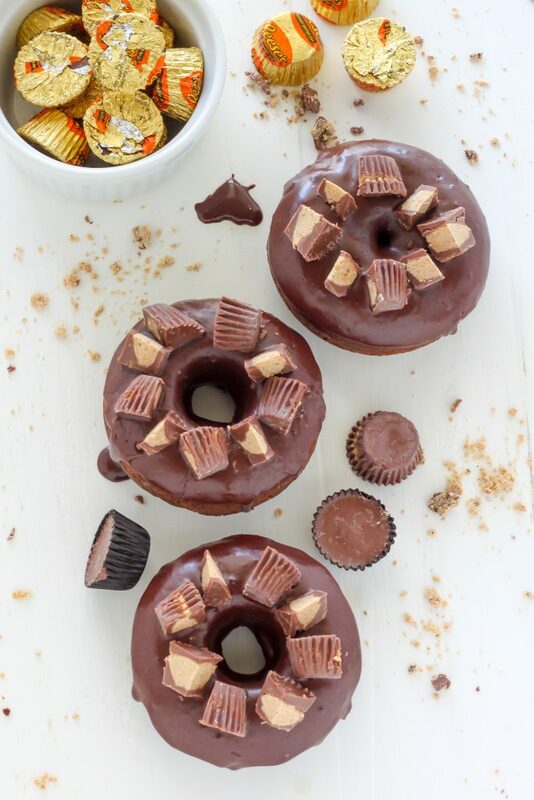 To decorate you’ll simply dip one side of each cooled donut into the ganache and top with a few chopped peanut butter cups. I like to let the glaze set for a few minutes (this takes about 20 minutes at room temperature and 5 minutes when you pop them in the fridge), but if you’re in a hurry, they can be served at once! 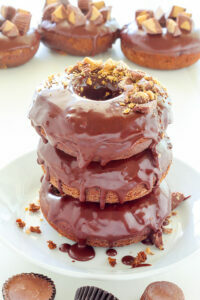 Baked, not fried, these Double Chocolate Peanut Butter Cup Donuts are ready in about 20 minutes! Spoon mixture into prepared doughnut pan. 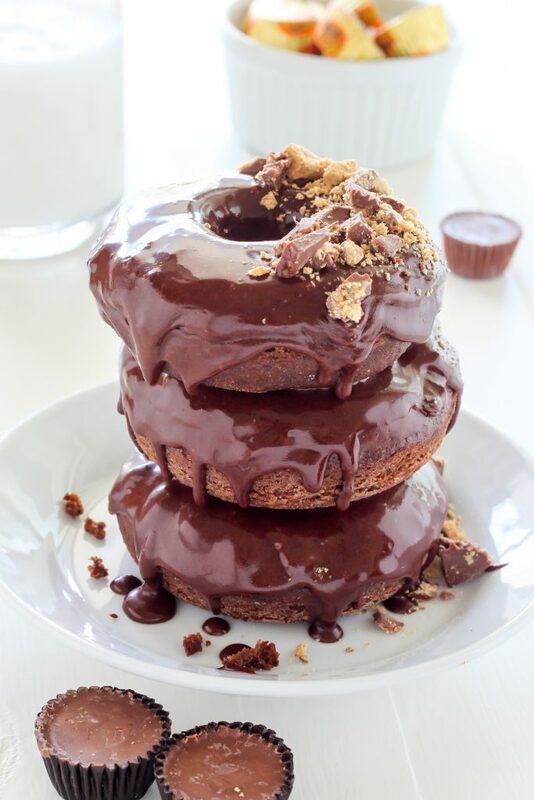 Press one chopped peanut butter cup (4 pieces) into the top of each donut and gently cover with batter. Bake for 10-11 minutes, or until the doughnuts spring back when lightly pressed. Be careful not to over bake here! Allow doughnuts to cool a few minutes in the pan before transferring to a cooling wrack to cool completely. While your doughnuts are cooling, make your ganache! Place the chocolate in a small heatproof bowl; set aside. Heat the cream in a small sauce pan over medium-heat; bring to a gentle simmer and remove from heat right before it starts boiling; pour over chocolate and allow the mixture to sit for two minutes; stir until chocolate is fully melted. Dip one side of each cooled donut in the ganache, then transfer back to the cooling wrack; repeat with all donuts. Decorate wet ganache with chopped peanut butter cups and serve. You are convincing me I need a donut pan!!! 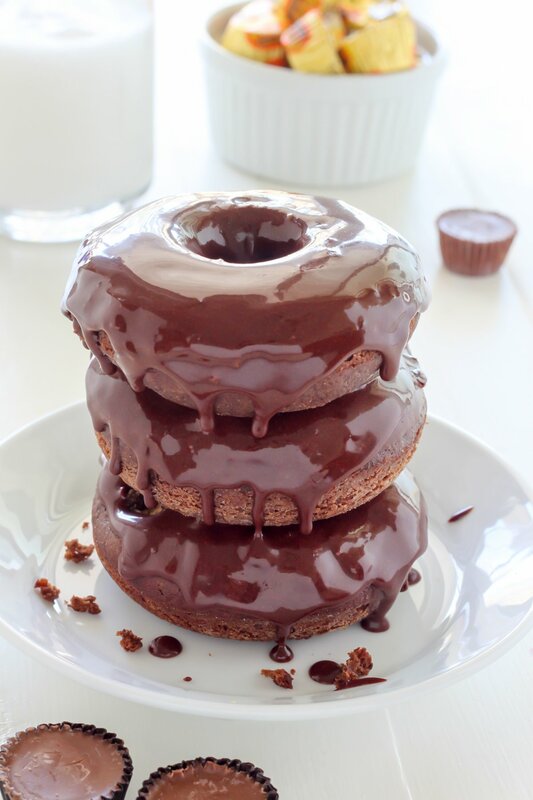 I need to check out getting a donut pan because these donuts need to happen! 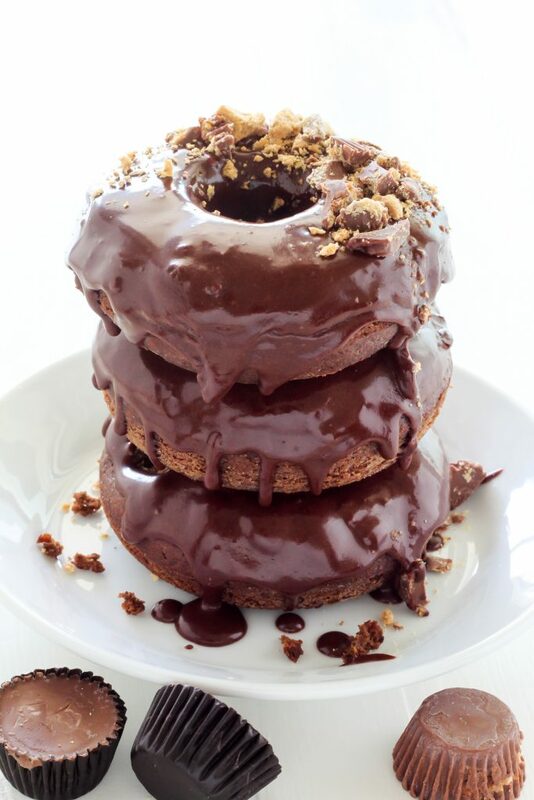 Seriously—you are a frickin genius with donuts! I love how decadent and chocolateyyyy peanut buttery delicious these are! Out.Rageous. These look like the most amazing things ever! I seriously need to start making doughnuts. These looks so good!